Mexico is a nation plagued by cartel violence, but all year round, tourists from across the globe visit hot spot destinations such as Cancun. The general consensus among tourists seems to be that yes, Mexico is dangerous but if you stick to the tourist locations you'll be fine. Yet again, this theory has been proven wrong as sicarios dressed as a Mariachi band opened fire with rifles and pistols killing three people Friday. The gunman injured another seven at least in a tourist plaza in downtown Mexico City, according to police. A police spokesperson said they were chasing three men dressed as mariachi musicians who had fled the scene on motorcycles. The country's government has been able to keep the violent crime at bay for years, but since 2014, homicides have surged to record levels. The high crime figures present a challenge to a new city government that has campaigned on promises to clean-up the communities of the criminals perpetrating the violent shootings and murders. Victims of this latest shooting were eating at a restaurant when the three mariachi gunman opened fire around 10 p.m., according to local media. Forensic officials have so far counted over 60 bullet casings at the crime scene. A disabled woman who sells cigarettes in Garibaldi described the scene saying, "People were screaming and running." Initially, the vendor says she initially thought she only heard was only fireworks. This is far from the first odd-style of attack committed by the gangs and drug cartels in Mexico. Earlier this year, beachgoers in Cancun were shocked to find themselves suddenly taking fire from several gunmen on water scooters. The jet-ski-style attack showed that not even the most private tourist beaches are safe from random shootings. The city of Cancun alone has seen over 130 murders between January and April in 2018 alone. The identities of the mariachi gunmen have not been released, but they were said to be men by local newspaper Milenio. Another local media outlet reported that two of the injured victims were women. 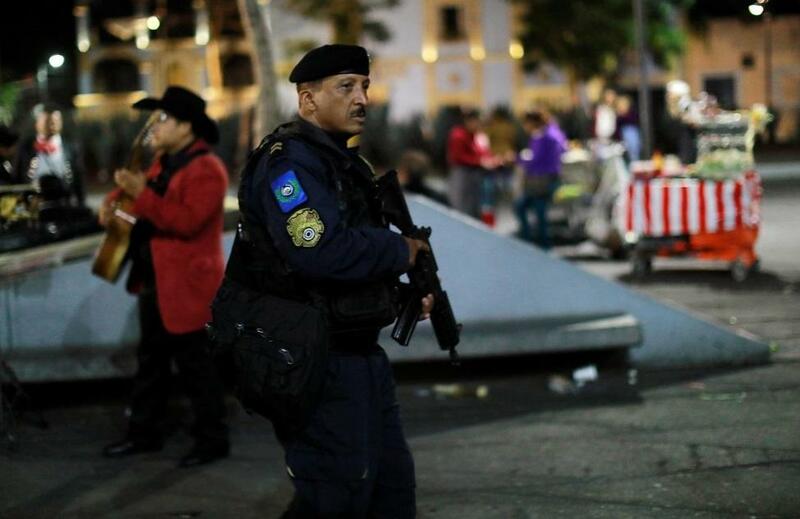 Mexico City police chief Raymundo Collins told reporters at a press conference that four of the injured were hurt when the gunmen tried to flee. "Nothing like this has ever happened before," Samuel said. He has worked for thirty years around the square in one of the most populated cities in Mexico but declined to be identified. Social media users uploaded video and photo from the shooting aftermath that shows a heavy police presence. The site of the attack has been cordoned off with yellow markers scattered everywhere to indicate where bullet casings landed. Despite the somber crime scene, music and laughter could still be heard nearby. Plaza Garibaldi is located adjacent to one of the Mexico City's most notoriously violent neighborhoods, Tepito, the home of the La Union gang. Police say La Union are a huge part of the spike in drug-dealing and extortion rackets. Police arrested the presumed leader of the gang last August, Roberto Moyado Esparza "El Betito". Since Esparza's arrest, a power vacuum has left the Tepito neighborhood in a new wave of violence that has already left several people dead. The Colonia historic center of Mexico City tends to be where the tourists flock to the most, Garibaldo is just on the edge of Colonia. The area is known for seedy strip clubs, dive bars, and even black market drug shops. U.S. civil rights leader Malcolm X’s grandson, Malcolm Shabazz, was visiting near the square when a dispute broke out over a nightclub bill. The result was Malcolm X's grandson being beaten to death. It is not clear what the three gunmen were trying to accomplish. Perhaps it was a targeted assassination of a rival gang member. So far, police have no leads and likely won't learn the identity of the mysterious mariachi group who appears to have made a clean getaway. They do not seem like amateurs and are probably experienced sicarios. The threat of violence in Mexico has spread to even innocent tourists seeking to spend a week together with their family. The rise in violence has prompted the U.S. State Department to issue a travel advisory for Quintana Roo urging "increased caution in Mexico due to crime. According to statistics from the Government of Mexico, the state experienced an increase in homicide rates compared to the same period in 2016. While most of these homicides appeared to be targeted, criminal organization assassinations, turf battles between criminal groups have resulted in violent crime in areas frequented by U.S. citizens." Funny that tourists that think they are safe and supporting the mexican economy are actually being protected BECAUSE they are supporting an agreement between the local governments and the drug cartel - do tourists realy think a big chunck of the money they spend down there doesn't end up on the hands of the cartels or at least enabling the MACHINE. Get a clue.